RGBHV is an analog interface that is commonly used in arcades, projector and home theater applications. Typically, RGBHV video is capable of carrying signals from 480i up to 1080p. Integrators and end users typically need an RGBHV converter to take an RGBHV signal and convert to a digital signal such as DVI, SDI and HDMI; however not limited to analog signals including component, composite and S-Video. 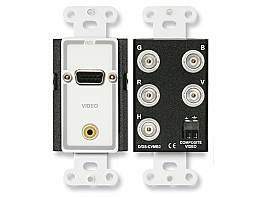 These converters may also operate vice versa where RGBHV is the output signal. These converters have the capability of up-scaling and down-scaling a video signal. Before we go any further let’s point out that analog RGBHV is slowly declining in use due to the fact that computers obtain higher quality clarity using DisplayPort or DVI digital connections and home theater systems are getting more accustomed to HDMI since analog connections can’t easily be made to support digital rights management. As true a statement as this is, many businesses can’t afford to fully upgrade to digital just yet and a system running RGBHV components may be inclined to use RGBHV converters in the mean time. As mentioned, we carry and stock a variety of converters from industry leaders including Kramer, Atlona, TVOne, Hall Research, Gefen, Shinybow, AJA and many others. If you still have questions regarding your application or which RGBHV converter to purchase, please call us and speak with one of our representatives to assist you.